Due to heavy construction on east-bound Cannon & around the lagoon, we’ve changed the route for Saturday! We still will ride on the bike path behind LEGOLAND, but come back west on Cannon avoiding the construction. 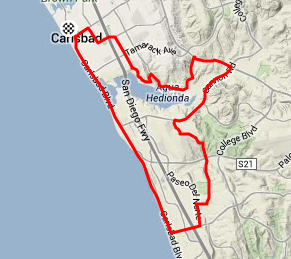 We’ll save the Carlsbad Lagoon Adventure for later this spring when the roadways are clear. See all of your smiling faces @ Carbon Connection – 8:00 am Saturday! We will stay together, so don’t worry if you are unfamiliar with this route. Please arrive with you helmet, water bottle filled, & of course your tires inflated properly. This ride is “no drop” ride and is open to any level rider that is willing to enjoy a casual pace.